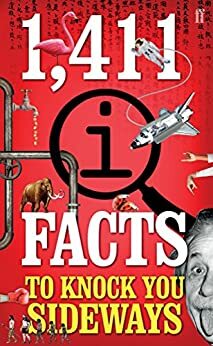 If there are any facts you don't believe, or if you want to know more about them, all the sources can be found on qi.com. This ebook edition now includes hyperlinked page numbers which give the reader direct access to the sources on the QI website. Interesting to browse through, some "facts" have been subsequentially revised, but still worth a read. If you have an excellent memory, you can bore the pants of people at a party. I must admit I was knocked sideways with this book, enjoyed the facts from the first to the last and that's a fact. 5.0 out of 5 starsBelieve it or not.. very good. This stuff never grows bad. I have the deepest admiration for the elves. While many of the facts in this book ARE Quite Interesting, it removes much of what makes QI enjoyable, as there is no humour from anything other than the facts, and there is no explanation of the facts. Also, at the rate that they post facts from this book on their twitter profile(and the individual facts are short enough to be in one message), all of these will be available there in a couple of years. I recommend that you follow their twitter profile, and leave this book alone.